NEW YORK (CNNfn) - A busy entrepreneur risks losing everything if he or she is temporarily or permanently unable to work and is not properly insured. Yet insurance executives estimate that only 30 to 40 percent of the nation's small-business owners have disability insurance. This is a chilling statistic, especially when you consider that at age 37-the prime age for an entrepreneur-the probability of becoming disabled is three and a half times higher than the probability of death. Virtually all personal disability policies offer the same kinds of benefits. They generally pay a monthly benefit that is slightly less than what you would earn if you were healthy and working. This gap is intentional: Insurers want you to have an incentive to get well and return to work. The kind of policy you qualify for depends on what you do for a living. Professionals, such as attorneys and architects, usually have the easiest time buying disability insurance. Automobile and real-estate salespeople, subject to the ups and downs of the economy, have a tougher time. People in risky professions -- such as private detectives, construction workers, and actors -- may have to look a long time for a policy. Insurance companies tend to distrust home-based entrepreneurs, thinking they are less stable and more likely to fake accidents. When my firm was home-based, I managed to buy disability insurance only because my insurance agent visited my office several times and convinced his bosses that I was running a legitimate communications business. Insurance underwriters look at the probability and length of possible disabilities when determining the type of policy you might require. They also consider the number of employees, the length of time you have been in business, and your industry's disability claim history. 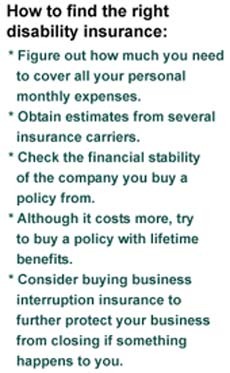 One way to save money on insurance premiums is by choosing a 60-to-90-day elimination period. This means you will have to wait a while before your payments begin. Insurance companies think if you are willing to wait for benefits to kick in, you might be less likely to claim a disability. Normally, disability benefits are tax-free. Always pay with a personal check. If your company pays for the premium and takes a tax deduction, your benefits will be taxed. Make sure your policy covers your specific occupation, not just any occupation. If you have a stroke and can't do your old job, you can collect your benefits even if you take up a less taxing, lower-paying occupation. Although it's cheaper to buy a policy that provides benefits to age 65, many agents recommend paying a bit extra for a policy with lifetime benefits. Excerpted from 201 Great Ideas for Your Small Business, Copyright 1998 by Jane Applegate. Published by arrangement with Bloomberg Press. Excerpts appear on Saturdays on CNNfn.com.